It is time for a new CTMH Annual Inspirations Book! It is hard to believe that the me has rolled around for a new Close To My Heart Annual Inspiration Book. The 2016/2017 book is here today! I've not been as good about posting as I once had been. I start out with the best intentions and then life gets in the way. Well, I am really going to try to do my very best maintain steady posts (this with a little help from my friend Karen.) We have decided to share posting time by featuring a product a month. 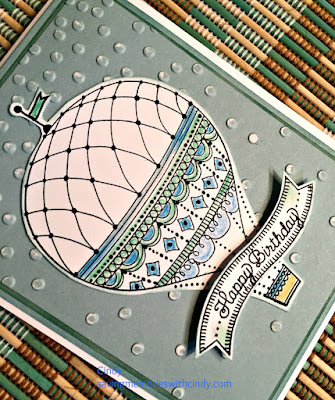 This month, to celebrate the new idea book, we chose to feature a wonderful stamp set called Balloon Wishes (D1667.) 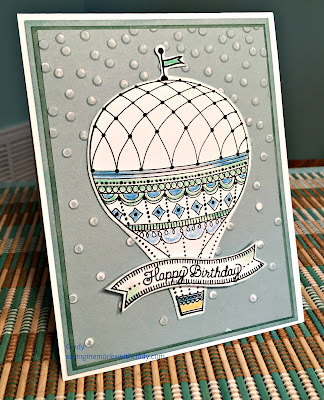 It highlights a hot air balloon that is perfect for watercolors, markers or paper piecing along with a number of useful sentiments. This set works perfectly for both scrapbook pages and cards. So without further ado, here is our first installment using Balloon Wishes. I used Glacier and Juniper card stock for the mats. The top mat of Glacier was embossed using the Confetti Embossing Folder (Z3118) and then sanded for additional texture. 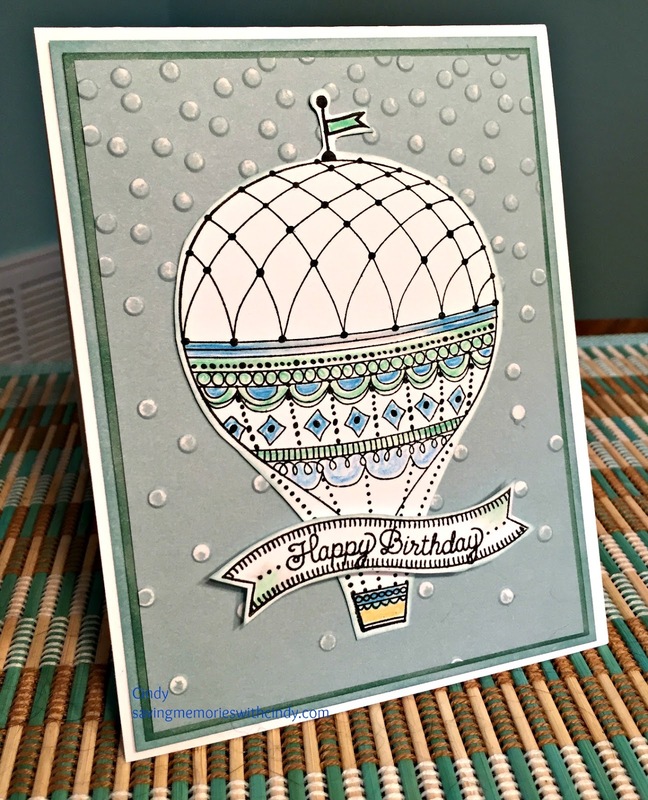 The balloon image and sentiment were stamped using Black Memento ink onto White Daisy card stock. Each was then cut out. 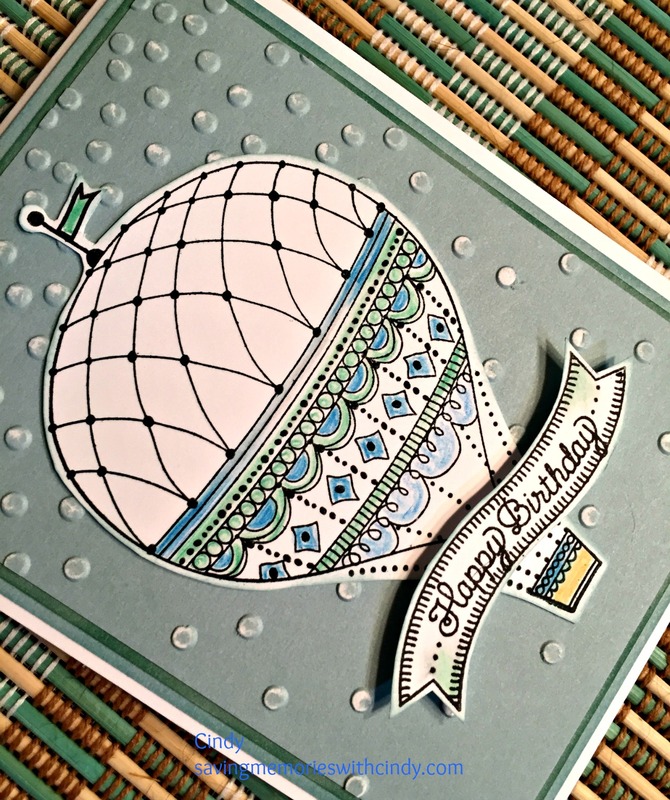 The Balloon was colored using my CTMH watercolor pencils (3505) and the color was blended with the blending pen (3174.) Lastly, the sentiment was "popped up" using 3D tape. This is just the first in many planned featured product posts. Remember, I mentioned Karen??? While I'm doing the featured post today, do not forget to head over to her blog for some of the fun things she has been doing. Next week, she will be doing a project featuring this same stamp set. I am going to try my very best to keep this posting going. It feels so good to be doing this kind of creating once again. If you are interested in seeing the new idea book, stop over to Karen's blog or visit my website for more information. For Now, Happy Crafting! In between getting ready for the upcoming release of the CTMH Spring/Summer 2014 Idea Book, I’m busy working on my February workshops. I think I mentioned before, how I was using ProPlayer. When you first look at ProPlayer, you assume that it is meant for young boys. And, yes, it is perfect for that type of project; but, this is what I love about CTMH, the versatility. I am using a stamp set called “Cup of Cheer” (B1404.) I think it is working well. What do you think? The faux ceramic tile is a really fun technique using Liquid Glass (Z679.) Here is how you make one yourself. 1. Start with a square piece of paper. I like to use nothing smaller than 3 x 3 inches. It will make the “math” easier and you will see why soon. 4. Next, coat each piece in Liquid Glass. I just put a dollop on each small square and smooth with my finger. Set aside to dry. 5. Once dry, it is time to reassemble the tile. I usually use a piece of Slate cardstock because the gray gives the appearance of “grout.” I cut the Slate square 1/8 of an inch larger than my original image square. Put the “puzzle” back together and attach each square using your favorite adhesive. Sometimes a corner might stick up a bit….just hold it down with Liquid Glass. This is a really fun technique. I think it is fun, too, to be creative and find alternate themes for the very versatile CTMH papers. If you need any of the products I’ve mentioned, drop by my website to place an order. For Now, Happy Crafting!